Benedictine Sister Juliann Babcock, who served as the seventh prioress of Our Lady of Grace Monastery in Beech Grove, died on June 15 at the St. Paul Hermitage in Beech Grove. She was 69. The Mass of Christian Burial was celebrated on June 19 at the monastery chapel. Burial followed at the sisters’ cemetery. Benedictine Sister Jennifer Mechtild Horner, the current prioress at Our Lady of Grace who succeeded Sister Juliann in June of 2015, spoke of how deeply the vocation to Benedictine monasticism was integrated into her friend and predecessor. “Sister Juliann had a deep, deep love of the monastic life,” Sister Jennifer said. “It was a place where she found great joy, and so she really shared her love of monastic life wherever she went. Sister Jennifer noted that Sister Juliann shared her love for monastic life more broadly on councils of Benedictine communities across the country and around the world. Sister Juliann also helped secure and implement a grant for Benedictine communities across the country to create videos for monastic formation, and to connect Benedictines in various communities in the initial stages of formation through digital communications technology. And she helped set Our Lady of Grace and its ministries on firm footing for the future by starting a capital campaign during her term as prioress, and planning major renovations to the St. Paul Hermitage and the Benedict Inn Retreat and Conference Center, both on the grounds of the monastery. Another legacy that will remind Sister Jennifer of her friend is her many works of art in ceramics, calligraphy and water color painting that continue to grace the monastery. Sister Juliann was born on Oct. 5, 1948, in Indianapolis and grew up as a member of Our Lady of Lourdes Parish on the city’s east side. After attending the monastery’s former Our Lady of Grace Academy as a high school student, she entered its novitiate on Sept. 7, 1966. She professed simple vows in 1968 and perpetual vows in 1973. Sister Juliann earned a bachelor’s degree in elementary education at the University of Indianapolis, a master’s degree in elementary education at Ball State University in Muncie, Ind., and a master’s degree in spirituality from Holy Name College in Oakland, Calif. Sister Juliann ministered from 1971-81 in Catholic schools in the archdiocese, serving at St. Anthony of Padua School in Clarksville from 1971-72 and 1979-81, Christ the King School in Indianapolis from 1972-73 and St. Pius X School in Indianapolis from 1975-79. She also taught at Meyers Public School in Cannelton from 1973-75. In 1981, she helped to open her community’s Benedict Inn Retreat and Conference Center, serving as its director of programming from 1981-90. 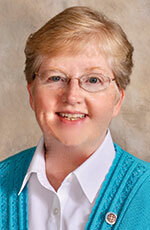 Over the next quarter century, Sister Juliann held several leadership positions at Our Lady of Grace, serving as vocation director from 1989-93, as oblate director in 1990, as subprioress from 1993-2001 and as formation director from 2002-09. In 2009, she was elected prioress of Our Lady of Grace and completed her six‑year term in 2015. She is survived by a sister, Mary Costello, and a brother, Dave Babcock. Both live in Indianapolis.